(a) Remove the tire valve cap. Keep the removed tire valve cap. (b) Remove the valve core to release the air from the tire. Make sure that a sufficient amount of air has been released. (c) Remove the nut and washer. (d) Drop the tire pressure warning valve and transmitter with grommet into the tire. The grommet may remain attached to the rim. (e) Using a tire remover, remove the tire from the disc wheel. Be careful not to damage the tire pressure warning valve and transmitter due to interference between the valve and the tire bead. 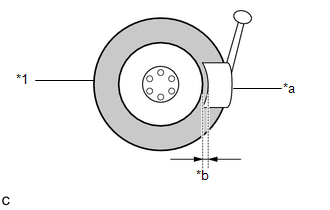 Set the tire remover shoe as shown in the illustration. (f) Take out the tire pressure warning valve and transmitter with grommet from the tire. (g) Remove the grommet from the tire pressure warning valve and transmitter.